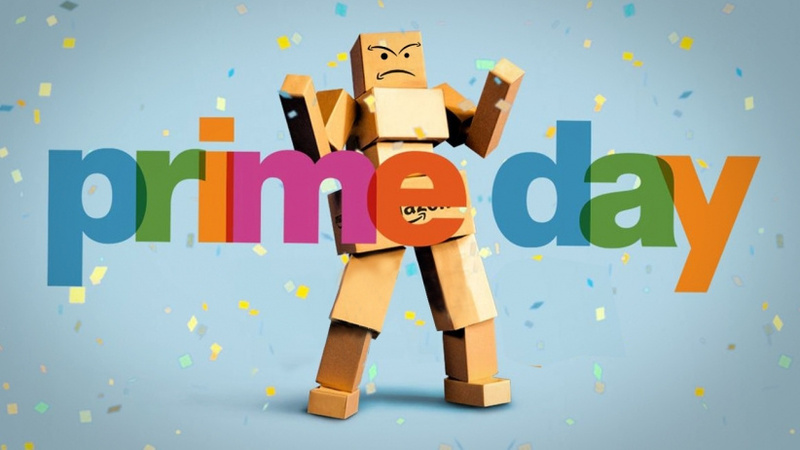 So, you have no doubt heard that it is Amazon Prime Day today. Now in its third year, this is the day when the online retail giant offers you even "greater savings than you might find on Black Friday", at least that's what they claim. We'll be rounding up some of the best (general) gaming and technology related deals for you on this page. Based on our findings last year, there should some decent gaming-related bargains to be had, but to begin with we might see more sales on general electronics. We'll be updating this page as new deals go live, so you might want to check back tomorrow if none of these are for you. Remember, you will need an Amazon Prime subscription to take advantage of these amazing offers, but if you don't have one, then simply click this link and you will be able to activate a 30 day free trial. That's it for now, not a lot of great deals for gamers, but that might all change tomorrow. Anyway, let us know if you spot any other decent deals in the comments below. Brought the ps plus sub but says I've gotta wait for verification? Anyone ever had this issue? @Rob_230 the only problem with that bundle is that farpoint doesn't look to come with the gun. Not sure how good it is without it. With the gun it is an amazing game. @Rob_230 @ztpayne7 yeah, we didn't include it because it doesn't look like it comes with the aim controller, which makes it less good. @ztpayne7 Yeah, would be ideal if it came with the gun attachment - although they seem to be like gold dust atm. How have you found VR since making the plunge - there are a load of games that interest me (Until Dawn, Resident Evil, Thumper, Rez, Danganronpa, Psychonaugts, Batman etc); and I have two hardly used PS Move controllers back from the PS3 days so it would be good to justify those purchases a little more. The deal on 15 month subscription is a steal so now along with the one I got last month I am sorted for the next couple of years. Also just ordered my amazon dot which I have been after for a while can not wait to use that. There are it seems a lot better deals than last year. Not really for PS4 but other deals a decent. Hoping for some good deals on some games I haven't picked up yet. There's a few I kept thinking maybe I'd wait til Black Friday, but if this is supposedly better...then maybe I won't have to wait so long. How many people managed to get CoD Infinite Warfare for free? I just missed out on it, they'd fixed the glitch by the time I went for it. That laptop is great for £700. @Rob_230 that is a stupidly good deal, effectively getting the psvr brand new for £260ish. Best deal of the lot to be honest. @BowTiesAreCool thanks! Ill be honest, that was the final motivation I needed. I have now ordered and am expecting delivery tomorrow. Very excited about this! The US deals are a flippin' joke. Crappy TV deals, game deals at dumb times, (Nioh went on sale at 6am?) and only one decent PS4 slim bundle. @RedMageLanakyn I missed most of today, out fishing with my family, but from what I've seen I agree, not impressed. Of course most people have said the same thing the past 2 years but here I am spending money anyway. So far I've made almost as much in Amazon credit - $30 - as I've spent. They really like when you voice buy with Alexa, probably b/c she pulls the trigger so fast. @rjejr There were a couple of decent game sales, but Nioh was at 6am for me, and skyrim only shows the X1 version on sale, even though it shows the PS4 box on the front page. Disappointing, but like you said, expected. I bought a couple movies, that's about it. @RedMageLanakyn I don't even have to care about the Amazon sale any more, Target.com got a bunch of amiibo in, so my son bought me Wolf Link for my birthday, so now I can finally start playing Zelda next week. @rjejr Wish I had a target near me! I'd love to get my hands on the Epona link or zelda. @RedMageLanakyn Since your account says US, here's the links. Guess you could be put off by the $6 S&H per amiibo, I have a Target Red Card so I get free shipping so I'm not exactly sure what it costs. Link on Epona, which Ntinedo humorously calls "Rider"
Good luck. i think I read Gamestop got more Zelda BotW amiibo in recently so I guess you can try there. They didn't get any Wolf Link which is why I was so excited today. Toys R Us always has lots of amiibo. Usually nto any that anyone would want, but they have lots. @rjejr Thank you, I'll keep those links handy. I was thinking of going the crazy route of paying someone $40 for 12 amiibo nfc "cards" just so i could quit whipping out the ones i have now every 24 hours. It's actually not a bad deal if you only own a few like I do. @RedMageLanakyn I think we own about 12 amiibo, but me being me, it's a haphazard bunch. The 2 Skylanders for DK and Bowser, which occasionally work as they are supposed to, not sure if it's coding or the twist base, silver Mario, green Yarn Yoshi, the first Link for SSB, which means we still need 8 more Links to complete the set - I don't count Wolf Link as Link as it's a Wolf w/ Midna and Midna's cool. We have 1 Mewtwo card that came w/ Pokken Tournament, not sure that works w/ anything else. Boy inkling from Splatoon but the girl inkling reskin, maybe Ganandorf, and my son bought Princess Peach for my wife, she keeps it on her desk at work so we don't have it here to play with. Actually the girl squid is on her desk as well. Oh and Starfox I bought for my kid as a stocking stuffer the year they released as he looked cool. I think we have 1 or 2 more Pokemon, but that's my kids thing so I'm not sure. I am planning on getting 1 of each of Cloud and Bayonetta for my birthday but only if my wife can sneak out of work and stand on line to buy them next Friday at the Ntinedo store, I'm morally opposed to pre-ordering toys. @RedMageLanakyn Oh, not that I mind, but that link to Etsy doesn't work, in case you were planning on buying something there later. And I just found out my Wolf Link won't be here until next Tuesday, stupid Amazon Prime is spoiling me, I may spend the afternoon driving around to local Targets - I have 9 w/ 10 miles - to see if I can find 1 in store. My car has AC, my house doesn't, and it's gonna be a hot one. @rjejr Sorry that link didn't work, long story short it's 18 NFC cards with all the amiibo data from all the LoZ toys with custom art, laminated, etc. It'll be a lot easier and cheaper than trying to find all those amiibo, saves on room, and Link will eat like a king forever! @Rob_230 you'll have a lot of fun if you can forgive the design flaws. I highly recommend Batman Arkham VR! @RedMageLanakyn Funny amiibo story. Went to Gamestop - my kid had a $30 GC from his birthday in January - and they had 1 of the Guardian amiibo for $19.99 so he bought it. And they had 1 of the Wolf Link amiibo so I bought it b/c, Target said it wouldn't be here until next Tuesday and I'm impatient. Then I get home and Target sent me an email saying it would be here Friday, and I'm not that impatient, I could've waited until Friday. So I'll play w/ this one, then return the Target 1 to Gamestop on Friday. Or sell it for $25 on Amazon. @Rob_230 hey just saw this post! Sorry! I'm enjoying it a lot, but not playing as much as expected because it's a hassle to put the cats away every time haha. I really like farpoint, until dawn, thumper, batman, London heist, and others. There are lots of demos to try. Can't wait for skyrim in vr! Interested to see how skyrim and fallout turn out in vr! @Rob_230 cool! I would only get psvr worlds if you're planning on showing several people. Ocean descent is hands down the best experience to show non-gamers or new people to vr. Other than that, London heist is the main reason to get psvr worlds. I think it just had a price cut in the us. Also just a note - fallout has not been confirmed for psvr. It's only for vive currently. I wouldn't necessarily get your hopes too high for it.